Most people despise the end of Sunday. This means that Monday, the dreaded start of the work week, is just around the corner. Most people don’ have a team that they trust at work. Most people are unable to be truthful with their boss, or even truthful with themselves about their work. Fortunately, I am not one of those people. I work with great people. They are kind, honest, caring, and very professional. I work at Berteig Consulting. My team is made up of four people, one of which is me. Travis, who is very gifted in the arts is also very professional and down to earth. Mishkin is an ideal boss who cares deeply about his co-workers, and treats us all like brothers and sisters. Laila is pure and able to make others feel completely at home (she is also my wife). I never know what will happen each week but I do know that I will be happy and enjoying the experience with such a wonderful team. 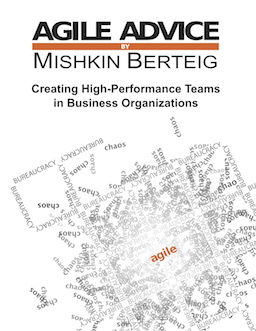 At Berteig Consulting, we practice Agile. I am currently working in the role of process facilitator for our new team of 4. We work in 1-week iterations. As a couple of the team members have a 4-day work week, we have our retrospective on Monday mornings at 10 AM, followed by the planning meeting for our next iteration at 11 AM. The remaining work days begin with a daily stand-up meeting using the reporting methods of a daily Scrum (each member reports 3 things to the team – “What I did yesterday”, What I’m doing today”, and “What are my obstacles”). We work in a collocated team room, with items, tasks, obstacles, definition of done and burn-down chart all up on the walls. We just completed our second iteration. As part of today’s retrospective, team members actually did some demos – Mishkin showed us some of the great changes he’s made to his course material and Paul demoed our beautiful newsletter. Laila even demoed some travel tools that she’s been working on for the trainers. We also decided to each write our reflections in order to share them with those who might find it useful as a way of wrapping up the retrospective for this iteration. Visibility of work and openness of consultation feeds an overall feeling of excitement and optimism in the team! Having worked at Berteig Consulting for merely two weeks, I already feel that I am part of a team. I feel that I am contributing in helping people with their business in an environment that is creative, supportive, joyful and cooperative. I know that each week will bring interesting new tasks that will not feel like a mundane set of work, or carried out in order to finish the week. Rather, each project is completed with a sense of contribution towards the company’s quest to be the best corporate educator for humanity. Were it not for Berteig’s positive atmosphere and team dynamic, this would not be possible. Agile methods promise early, continuous and accelerating return on investment for stakeholders and a high level of job satisfaction for teams. Agile methods are appropriate for a variety of projects including program development, materials development, new product development, IT projects and software development outsourcing. In this three-day course, you will learn the foundational skills of agile process facilitation and project management, focused on the role of the ScrumMaster (also known as: Agile Project Manager, Process Facilitator, Team Coach). In this 3-Day course participants learn how to guide a team, a project, or an organization into a process of rapid delivery of valuable results. Exercises, case studies, and examples are used to assist participants to develop the knowledge, skills, capabilities and insights needed to make the shift from traditional management practices to Agile practices. • to improve the lives of the team members by facilitating creativity and empowerment. Why is this ScrumMaster course better than others out there? • Low class size with a maximum of 15 students compared to some trainers with 20, 30 or even 50 students! Command Scrum – Productivity at What Cost? I highly recommend reading two articles about the possibility of imposing Scrum on a team and what the results are of doing so. The first, an article titled “Shock Therapy” by Jeff Sutherland with an extensive report from Scott Downey of MySpace. The second article, “Shock Therapy or Compassion” by Tobias Mayer, provides a thought-provoking alternative view. The only addition I would like to make is just to ask a simple question: is everyone motivated by the same thing? I suspect that the knee-jerk reaction is a big resounding “no”, but I ask you, my gentle reader, to consider more deeply. Does anyone really get satisfaction out of purposeless work, no matter the other rewards? There is a strong case to be made that in fact humans thrive on solving meaningful problems… problems that are meaningful to themselves, their community and to humanity in general. I would also like to point out some coaching models that often start with short term pain, discomfort and even a strong desire to rebel: a personal trainer at a gym, a business coach, a life coach, an executive coach, etc. etc. The trick is, of course, that you get into the coaching voluntarily in the first place. You put yourself in the coach’s hands and trust / suspend disbelief for just a short time while the coach helps you go through the discomfort. It takes a good coach to make this work. The benefits are huge. Anyone who has made it to the other side of that discomfort knows this. Anyone who hasn’t made it to the other side is going to be understandably skeptical. So is what Jeff and Scott are describing really “command-and-control” Scrum? Is it breaking the principles of Self-Organizing teams? I don’t think so, but how about you? What do you think? Do you think you would be better off or worse off with this sort of “help” with starting Scrum? A friend and fellow coach, Declan Whelan, let me know this morning about a great event his is helping to organize. Jeff Patton will be delivering a one day workshop on agile product design and development next week on Wed. Sep. 10th in Waterloo, Ontario. Find out more about the agile product design and development workshop. Jeff will also be providing a free 90 minute talk on Sep. 9th with the title “Embrace Uncertainty: Strategies for an on-time delivery in an uncertain world“. The summer has been interesting for me. Lots of really great things including the Agile 2008 conference, some really great training experiences, and some really great business challenges. I’ve learned a huge amount over the last few months. In many ways, September always gives me the “back to school” feel from when I was growing up. This year it is particularly so. This year, I’m working with a team instead of on my own. This year, I have a systematic approach to running my business using OpenAgile. This year, I’m being deliberate about creating my corporate culture. One thing I wanted to share publicly: Berteig Consulting has the start of a vision and mission. For several years now, I’ve been focused on agile methods. But I also have always known that in many ways those methods are not what I am committed to. Rather, there is something deeper. Berteig Consulting is going to be the best corporate educator of humanity. Agile methods are a tool or set of practices that are compatible with this vision. We teach agile methods, we mentor and coach agile methods, and agile methods themselves help individuals, teams and organizations to learn – to self-educate. So using agile methods enables our vision. But it doesn’t stop there… (to be continued).